Belgium set up a quarter-final against Wales with a superb Eden Hazard-inspired display in which he scored and assisted a goal respectively. 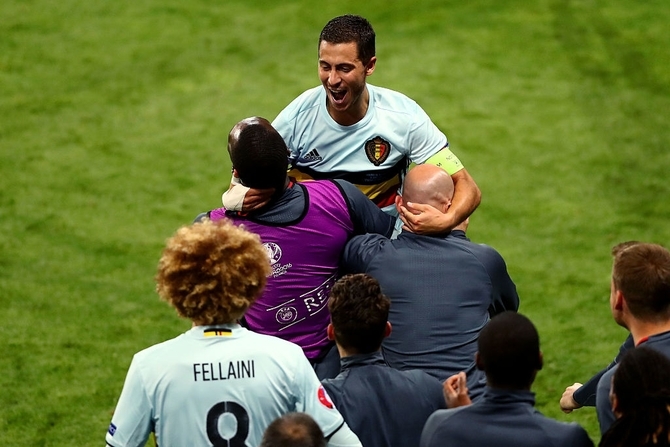 IMAGE: Eden Hazard of Belgium celebrates scoring his team's third goal with his teammates and staffs. Photograph: Dean Mouhtaropoulos/Getty Images. An early Toby Alderweireld header was the prelude to three late goals that sent Belgium past Hungary and into a UEFA Euro 2016 quarter-final against Wales. Hungary had a pre-game blow when Laszlo Kleinheisler was injured in the warm-up and Adam Pinter was pressed into action. As if emboldened, Belgium started just as Wales did in beating Russia 3-0 in the last Toulouse group game, tearing into Hungary and taking the lead when Alderweireld rose to head in a Kevin De Bruyne free-kick. IMAGE: Toby Alderweireld (2nd R) of Belgium heads the ball to score the opening goal against Hungary. Photograph: Richard Heathcote/Getty Images. Gabor Kiraly did brilliantly to tip another De Bruyne set piece onto the crossbar; the Manchester City man, Eden Hazard and Dries Martens –preferred to Yannick Carrasco – were buzzing about behind Romelu Lukaku, swapping positions at will and launching attacks with the aid of Axel Witsel and Radja Nainggolan. 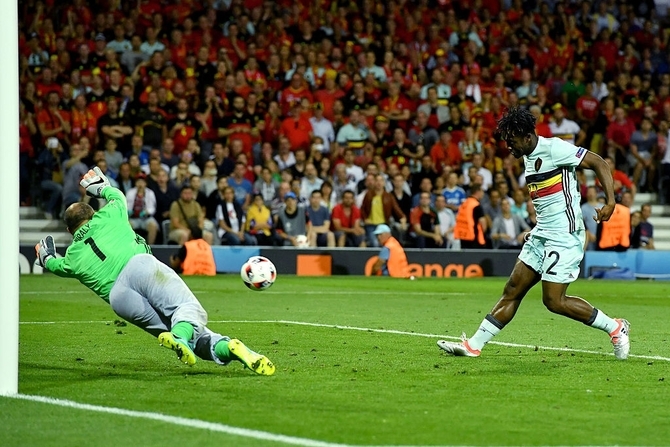 IMAGE: Michy Batshuayi of Belgium scores his team's second goal past Gabor Kiraly of Hungary. Photograph: Dennis Grombkowski/Getty Images. Kiraly made seven first-half saves and his eighth was seconds after the break to deny Hazard, and although Hungary then had a promising spell, Belgium were soon back in control. And two minutes after his introduction, Michy Batshuayi marked his first finals appearance by tapping in a Hazard pass with his maiden touch. Two minutes later Hazard's shot made it three, capping a display in which he had given full rein to his talents, and Carrasco, also off the bench, claimed the fourth at the death.